It's late April and the sun is just beginning to rise over the Bowerman Basin, a muddy bay in Washington's Grays Harbor. Very little mud is visible right now. One of the highest tides of the month, 8½ feet, is covering much of the mud. Tens of thousands of shorebirds are covering the rest. 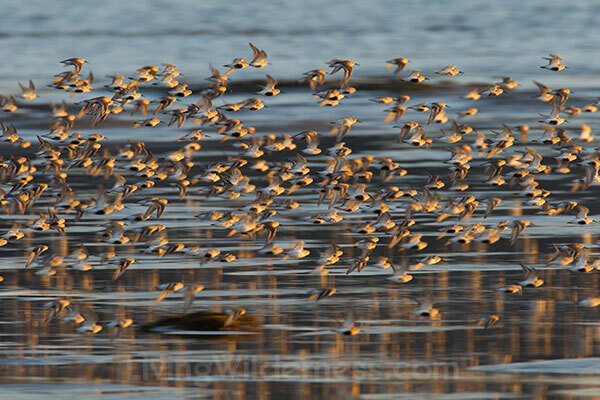 And more shorebirds are on the way. Over the span of a few weeks, maybe a million shorebirds will stop here. 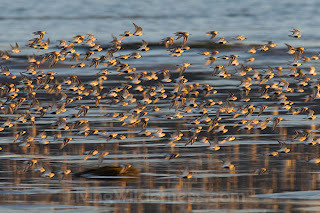 The flock consists mainly of western sandpipers, dunlin, two varieties of dowitchers, and plover. They're on their way to breeding grounds in Alaska and northern Canada, but given that some started in Chile and Argentina, they tend to take a few regular breaks on their way north. Grays Harbor is one of the few major stopovers.